On June 6 and 8, Ithaca High School (I.H.S.) held its underclass and senior awards events. Each year Ithaca City School District (ICSD) students, staff, and school programs receive awards and scholarships totaling $5000 from funds managed by the Ithaca Public Education Initiative (IPEI). The I.H.S. Senior Class Fund generates three awards for members of the I.H.S. community, recognizing a new teacher who exemplifies enthusiasm and creativity, a school club that makes a positive impact on student life, and an I.H.S. staff member who has had an impact on the class. The recipients are annually selected by ballot by the senior class. I.H.S. Class of 2017 officers James Yoon, Yolore Airewele, Josh Slusar, and Mrinal Thomas presented this year’s awards. The New Teacher Award went to Jonathan Shyne, Technology and Digital Media teacher; Brenda Sullivan, Senior Typist, received the Staff Member Award; and the Student Organization Award recognized the I.H.S. Tattler, student newspaper. 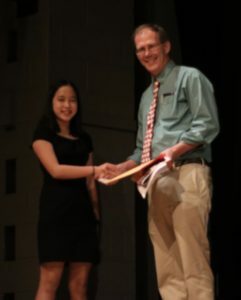 The Yan Wang ’05 Memorial Scholarship was awarded for the first time on Thursday night. After Yan’s tragic death in 2015, friends and family made donations to create a scholarship fund to honor his memory. According to his father Yumin Wang: “Yan believed in the importance of recognizing merit and he served as a role model of excellence to those around him as a high school student and beyond in college and in his profession.” Through IPEI and in memory of Yan, the fund will encourage excellence and STEM (Science Technology Engineering Math) education for Ithaca High students by presenting annual Yan Wang Scholarship Awards from the fund income. Yan’s mother, Cindy, and sister Julia Wang, along with Code Red Robotics Faculty Advisor Ian Krywe, presented the award to Elliot Richards, past president of Code Red. Senior Sandra Stromswold is this year’s recipient of the Carol Jean Buckley Scholarship for Students in the Arts. Art teacher Carol Spence presented the award that was established by Buckley’s family and friends to provide a scholarship to talented students pursuing advanced study in the arts. The Noreen Moore Memorial Award was awarded at the I.H.S. Convocation to senior Juan Paulino. The scholarship is presented to a senior who has the potential and desire to make the world a better place. Barbara Bergman, the I.H.S. 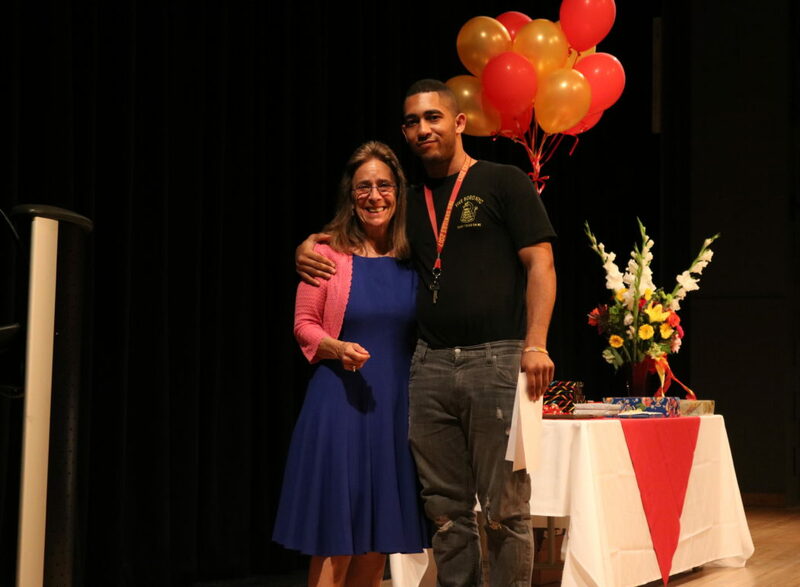 Family Liaison, presented the award in memory of Noreen Moore, who was an active member of the school district staff and community and advocated throughout her life for families in need. Rachel Jeon, a junior, received the Raymond C. Loehr Environmental Science Scholarship Award on June 6 at the Awards Ceremony for Underclassmen. Presented by Jamie Loehr, this award recognizes an underclass student who shows promise in environmental science. The family of Raymond C. Loehr created the Loehr Scholarship for Environmental Science to honor his 70th birthday and to recognize his lifetime of commitment to education. Emily Morse was named as the recipient of the Lee Strebel Memorial Award for Enthusiasm in the Performing Arts. She accepted the award that is coordinated by the Fine Arts Booster Group on June 6 from Lorraine Tino, drama teacher. The Lee Strebel Memorial Award is presented each year to an I.H.S. student who has not only participated in performing arts at the high school level, but has shown extraordinary spirit in that pursuit.